AGTER - The ‘4 per 1000’ initiative : caution ! After traditionally being conspicuous by its absence from public policy, the soil has been drawing increasing interest in recent months. The FAO (Food and Agriculture Organization) decided to proclaim 2015 International Year of the Soils, and soil has taken up center stage in an initiative launched by France, around two highly topical themes: agriculture and the climate. Agriculture is one of the main sectors responsible for climate change but is also strongly affected by its impacts. With many years of experience in agroecology and soil, civil society organizations are pleased to see the growing interest in these issues. After receiving hardly any attention in previous climate negotiations, it is important that they now be considered priorities at the COP21. 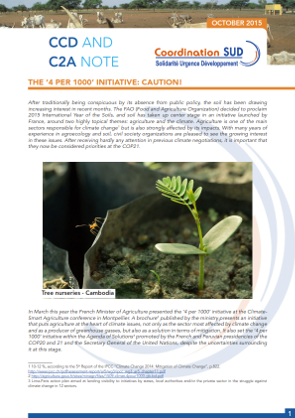 In March this year the French Minister of Agriculture presented the ‘4 per 1000’ initiative at the Climate-Smart Agriculture conference in Montpellier. A brochure published by the ministry presents an initiative that puts agriculture at the heart of climate issues, not only as the sector most affected by climate change and as a producer of greenhouse gasses, but also as a solution in terms of mitigation. It also set the ‘4 per 1000’ initiative within the Agenda of Solutions promoted by the French and Peruvian presidencies of the COP20 and 21 and the Secretary General of the United Nations, despite the uncertainties surrounding it at this stage. Initiative « 4 pour 1000 » : soyons vigilants !